I visit the Itty Bitty Kitty Committee every day, but you have to check out this series of photographs. Scroll down to the end! The man in the pictures is the father of the blogger. Next, if you live in New York, a cat film festival this Friday at Anthology Film Archives: CHAT D’OEUVRES. 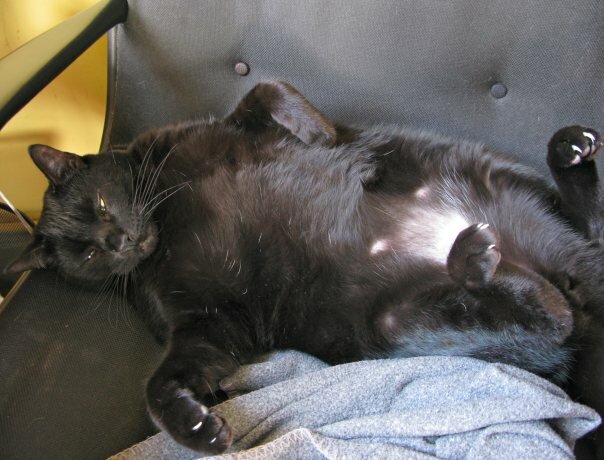 And finally, Finney and his belly. And the man in the photo, Laurie’s dad, has adopted two of an earlier IBKC litter. Have to get my Itty Bitty fix every day along with Sue’s Pitter Pats of Baby Cats. She’s there in Tacoma with Laurie, in case you aren’t familiar with Sue’s blog. I don’t think I am, I going to go luck now, thanks for the tip.